Modular integrated lighting system WLightiT® with light emitting diode light sources is designed for general and emergency lighting, video surveillance, object movement control, fire and security alarm in public and office buildings, as well as service industrial premises with artificially controlled climate conditions. The lighting system WLightiT® consists of zone groups of lighting lines equipped with movement and smoke sensors, as well as video cameras. Modularity simplifies configuration and assembly of products. Lighting line is assembled from separate types of lamps by means of bayonet connection. Splitting method while assembling the lighting lines from single lamps easily commutes hidden power and communication wiring installed in lamps. Integrated control system of lighting and terminal equipment provides a single-point operation, as well as automatic control of performance capacity for each element. Application of modular lighting system at facilities with high process density (data centers, industrial workshops and buildings, warehouses, public access premises, engineering centers etc.) allows not only to reduce lighting costs (during assembling and operation), but also substantially simplify security systems of the facilities by means of high component integration, reduction of assembly works at the facility and system maintenance. A distinctive feature is a complete preparation and testing of all equipment at a plant before transportation to a facility. All active equipment is completed with connectors and tested for correct connection. It simplifies an assembly process and in most cases helps to avoid connection errors and finally saves engineer’s time at the place of installation. Modular lighting system consists of lighting lines groups (3) commuting to control cabinet (1). Cabinet of emergency lighting connection may be also be added to the group (5). 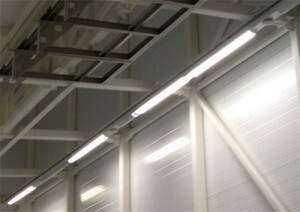 Lighting lines consist of modular lamps (4) according to line functionality. Line of lams may contain up to 20 lamps. 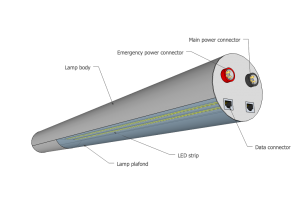 However connection of lamp line to general and emergency networks, as well as to data communication network, is performed in one connection point in line. It helps to achieve substantial savings as for materials, assembly and subsequent maintenance, increases the reliability of lighting system by means of minimization of assembly works at the facility. Modular lamps are part of lighting and security solution of a facility. They are also used independently as a single light source. Passive IR sensor is applied for motion detection in a detection area. Lamp lines are equipped with relay motion sensors. One line has no limitations in terms of quantity of installed sensors. Basic lighting in line turns on according to motion sensor. Relay signal output to security alarm and video surveillance systems is also possible. Fire-warning system sensor is applied for detecting smoke in protected premises. Lamp lines are equipped with digital address sensors of fire-warning system. 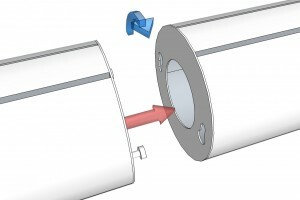 One line has no limitations in terms of quantity of installed sensors. Signal from fire-warning system sensors is directly commuted to controllers of fire-warning system at the facility. Digital video surveillance camera is applied in systems of point video surveillance. Modular lighting systems provide performance monitoring of video surveillance cameras, as well as their automatic switching-on and switching-on of camera’s highlighting by modular lamps. Each line is equipped with one camera. 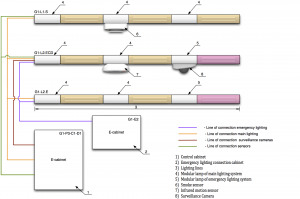 Lighting line of modular lighting system has a separate input of electric power supply for emergency lighting. Modular lighting control system controls the performance of modular lighting. Automatic control of equipment and indication of errors. Compatibility with all currently existing systems of point security provision. Application of light-emitting diodes with extended operating time. Simplicity and convenience of assembly. Minimization of operating costs. To evaluate the order volume there is a range of products and rules of their combination. Lines of modular lams are joint into groups according to best topologic location in the premises of a facility. The group has one control board (when applying emergency lighting two control boards are required). Control board is supplied with connection cable of desired length. Modular lamps are assembled in one line according to the following requirements. Line of modular lamps is a combination of different types of lamps that starts from connection lamp and ends with end lamp. The line requires indication of its functionality. Modular lamps are chosen depending on combined functionality of each lamp. For example a lamp line may include two lamps with installed motion sensors. The sequence of location of different types of lamps in one line is not discussed specifically, though location of fire-warning sensors can be specified. Lamp line requires specification of the first and the last lamp in the line.